Since 2014, Ontario Association of Certified Engineering Technicians and Technologists (OACETT), in partnership with the National Engineering Month Ontario (NEM) Ontario Steering Committee, has presented the NEM Ontario College Student Challenge. The competition invites students from colleges across Ontario to host an event or series of events during NEM and compete for a three cash prizes: $3000 (for first place), $1500 (for second place), and $750 (for third place) and complimentary one-year OACETT memberships. This year, NEM 2018 Challenge featured 10 student teams from 6 different colleges. A total of 14 events were run in conjunction with OACETT chapters in their region during National Engineering Month in March. NEM Ontario 2018 Challenge Winners and Ranking! 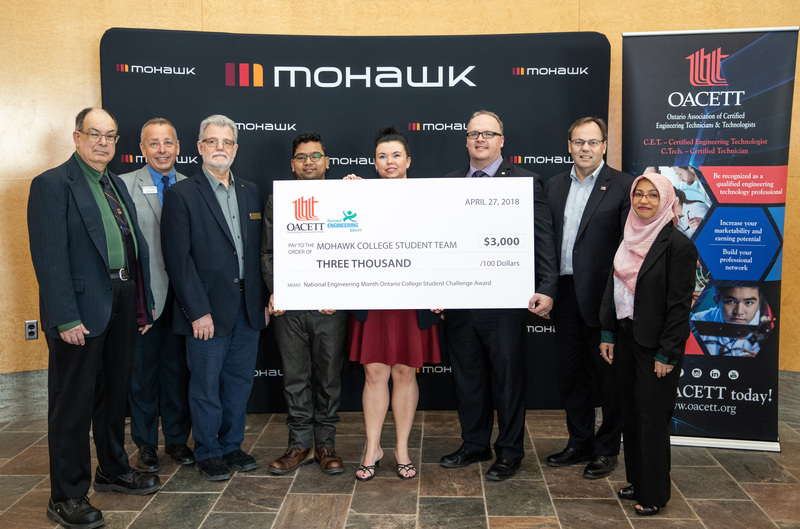 The National Engineering Month of March was celebrated all month long at the Mohawk College. The first event was organized in collaboration with Social Inc. on Wednesday, March 7th, 2018 to celebrate Women in Technology as part of the International Women’s day. This event promoted dialogues on gender inclusion and diversity in Engineering Technology at the Arnie, Mohawk College Students favorite social spot. Students from various backgrounds shared their experiences in S.T.E.M., while trying out a few technology related gadgets. The second event, entitled “Research and Entrepreneurship in S.T.E.M.” on Wednesday, March 14th, 2018, were presented by Professors Rubaid Khan, Andrea Johnson and Dr. Ethan Paschos from Mohawk College to encourage students to use creativity and imagination to turn ideas to reality. Professor Khan and Dr. Paschos shared current research at the college and innovative solutions to reversing technological damages to our environment. Ms. Johnson provided some key tips to start thinking like “intrapreneurs” (practicing entrepreneurship within a safety net of another organization) and entrepreneurs in S.T.E.M. Attendees were engaged and were given further opportunities to inquire about being involved in the current research and entrepreneurship related projects at the college. Members from the NEM Team also volunteered at the Manufacturing Industry night organized by the Engineering Technology department. Held on Wednesday March 21, 2018, employers from the electrical, mechanical, chemical and computer engineering industries were present to interact with students of the College. The third event held by the NEM team was a movie night on Thursday, March 22, 2018, featuring, “Hidden Figures”. This movie is based on true events about the lives of some of the first women in NASA, who helped shape the world as we know it in the field of outer space exploration. This evening provided a relaxed atmosphere for students to enjoy including popcorn and pizza. Lastly, the National Engineering Month at the Mohawk College ended with two guest speakers from the industry: Bill Docherty, C.E.T. City of Hamilton and Adriana Perri, Scientist from Estée Lauder. Incorporated in the DNA of their companies is to ensure the health, safety and happiness of the population, to do this, engineering technologists are the key. In addition, each speaker shared information about their respective companies and their experiences with students to aid them in future employment opportunities. The afternoon was concluded with a luncheon, drawing raffles to win one of three OACETT Student Memberships, and Volunteer appreciation. Running a large number of diverse events to spread well aligned messages about engineering and technology in unique and innovative ways. Collaboration is key! Find like-minded groups, organizations, associations or individuals to work together with to help amplify the NEM messaging. Brianna Coco hosted a tour and speaker series for the female students of Regiopolis Notre-Dame Catholic High School. The event, W.I.E Tour and Speaker Series, was aimed to break the stereotypes of women in engineering and to inform young girls of the many opportunities engineering can offer them. It was held on March 28th and featured a presentation that spoke about the various stereotypes woman face in engineering, the different types of engineering that are offered and how woman in engineering also play a huge role in our lives. The girls participated in a challenge to build either a building or a robot out of blocks for a simple and informative competition. After the top three winners were announced the girls were invited to lunch and Q&A with two female, third year students from the instrumentation program. After lunch, the girls were sent on tour which included views and information on the civil, soil, mechanical, electrical and wind turbine labs. Participant engagement, offering a memorable experience to an under-represented demographic with interactive, hands-on activities, meaningful tour experiences, and real-life role modeling. Get great engagement with participants through hands-on activities. Hand-on experiences are more than just a fun learning opportunity, they offer an opportunity to connect and communicate with participants in an engaging way. National Engineering Month aims to promote engineering by focusing on the problem-solving, innovation and world-improving aspects of the industry. For the second year in a row, Team Two from St. Lawrence College organized an event to allow youth in the area to explore different engineering concepts through immersive activity. They partnered with Scouts Canada, an organization that promotes supportive educational experiences for all ages. Last year, they chose to organize an event very close to their hearts- a bridge building/breaking competition. This event is a key part of the first year of the Civil Engineering Technology program at St. Lawrence College, and provides a close-up look into the design parameters, testing and results that affect the civil engineering industry. nce again, the organizers visited 15+ Scout groups to present the competition, provide materials and guidance on bridge building, and stayed in close contact with the Regional Scout Leader and individual Troop Leaders. Though the bridge breaking remained the core activity of the event, the organizers wanted to expand the event to include other engineering disciplines, allow their classmates to showcase their unique engineering passions, and reach many more people. Local companies/clubs and other college faculties were invited to showcase the different ways that engineering affects their everyday lives. The goal was to provide a broad spectrum of how engineering can affect our every day lives and make everyone feel welcome within engineering. Building on the success of previous year’s events by being innovative, expanding the messages and amplifying the experience. Take what’s worked well in the past, but don’t stop there! Creativity and imagination are one way we like to talk about engineering and technology, and you can apply those ideas to engineering outreach to. When planning an outreach event, consider elements of event that have worked very well in previous years, what could have been done better, and some new ideas to experiment with.